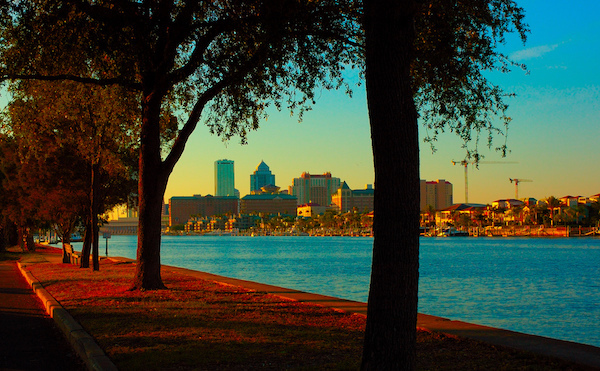 The Davis Islands is a series of several islands connected by bridges, just south of the Tampa Convention Center and hospital. It is possible to follow a very pleasant route along the Seddon Channel. It’s also connected to the norther terminus of our Bayshore Blvd. route. From Tampa Hospital, take Columbia Dr. heading south, which turns into Channel Dr. after 1 mile, with the water on your left. You’ll turn inland on S. Davis Blvd. for about 1 mile, skirting the edge of the private airport, and then a great last mile on Severn Ave., around Seaplane Basin to the Davis Island Yacht Club. There’s a separate pedestrian path for a brief section off Severn Ave. For business travelers, this is a good spot to run near the Convention Center. For the return, you can retrace your steps, or do an inland route along pleasant residential streets. Follow Davis Blvd., or wind your way among the neighborhood streets.